Have you ever winced after sipping a cold drink or eating ice cream? Did you get a jolt of tooth pain from the cold? Or maybe flossing makes you cringe because it gives you a sharp, uneasy sensation? The culprit may be sensitive teeth, and according to the Academy of General Dentistry, more than 40 million adults suffer from it. Tooth sensitivity occurs when the protective enamel layer of our teeth becomes too thin, or when our gums recede, exposing the dentin. The dentin contains microscopic tubes, and when you lose your protective enamel covering, these tubes can allow heat, cold and acidic foods to stimulate the nerves and cells inside the tooth. This is what causes discomfort and sensitivity when you eat or drink something very cold or hot. 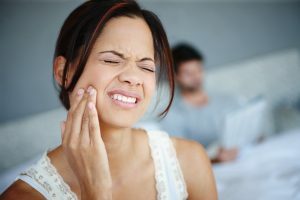 Of course, tooth pain can also stem from a cracked tooth or tooth decay, so be sure to come into Gladstone Family Dentistry to let us determine the cause before deciding on a plan of action! If your pain does stem from tooth sensitivity, it’s important to understand what may be causing it, as well as how to treat it long term. If you notice sudden pain or aching in your teeth when engaging in any of the above, you may be one of many people dealing with teeth sensitivity. But what causes this annoying and frustrating pain? There are several possible culprits. As you’ll learn in this blog post, tooth sensitivity can occur when using over-the-counter teeth whitening products and toothpastes, which are often acidic and abrasive and can wear down your protective tooth enamel. That’s why we recommend using a safer, less acidic product like product like Oral Biotech’s CTX 4, Arm & Hammer’s Advance White with Baking Soda or, even better, coming into our office for a professional whitening using technology that doesn’t harm or strip your teeth. Perhaps surprisingly, long-term use of certain mouthwashes may also contribute to teeth sensitivity. Like with toothpaste, many mouthwashes can be overly acidic, so it’s better to opt for a neutral fluoride mouthwash that won’t irritate the protective covering of your teeth. One example of a neutral pH option is ACT Fluoride Mouthwash, which strengthens and hardens enamel rather than wearing it down. Sometimes, tooth sensitivity comes from overeager brushing. If you’re brushing your teeth with too much force or using a hard-bristled brush, you can wear down the protective layer of your teeth over time. Switch to a softer brush and be sure to use gentle pressure and strokes when brushing to avoid enamel abrasion. Do you grind your teeth during sleep or when you’re feeling stressed? Grinding your teeth can also wear down enamel. If you find that you grind your teeth during the night, talk to us about getting fitted for a mouth guard to protect your teeth. Acidic foods can also play a role in tooth pain. If your dentin is exposed from enamel breakdown, acidic foods such as tomato sauce, orange juice, lemon and grapefruit can irritate exposed nerves. Avoiding acidic foods can help you avoid pain. Of course, periodontal disease (gum disease) may also be responsible. Receding gums can expose dentin and increase tooth sensitivity, while plaque buildup can eat away at protective tooth enamel. That’s why it’s so important to come in for your regular cleanings and check ups so that we can prevent plaque buildup and gum disease, as well as address any problems early on. Whatever the cause of your teeth sensitivity, the right toothpaste can often help. A toothpaste formulated for sensitive teeth will contain compounds like potassium nitrate that help block the painful sensation traveling from the tooth surface to the nerve. And since tooth sensitivity occurs when the enamel that protects our teeth becomes too thin, you also want a toothpaste that will remineralize and strengthen tooth enamel to help reduce sensitivity over the long haul. You’ll find some great options in our blog post on choosing the right toothpaste here. When in Doubt, Come See Us! If you are experiencing any type of tooth pain, we can help! Schedule an appointment with Gladstone Family Dentistry today so we can get to the root of your problem and suggest solutions that will help you feel your best.